Yes it does, but I do not lay claim on this insight whatsoever. This work is by Rudolf Gantenbrink and you can find it here. In essence, he lays a 7-by-11 cubit grid over the interior. My published findings are consistent with this grid because 8x35 is 40x7 and 8x27½ is 20x11. I realize there are other ways to think about this when you look at Khufu Akhet in isolation, but my argumentation derives much, though not all, of its weight from the apparent common design theme discernible in prior monuments' dimensions (which I argue stems from astronomical observations) most importantly the casing of Meydum whose design is not consistent with a 28 r.c. architectural unit, and the theology with which this theme jives. There is a key insight by Gantenbrink which is worth emphasizing and to which the other poster's admonishment also alludes: The idea that one must look for an exterior design metric which yields whole numbers, if one wishes to elucidate the designer's thought behind his/her framework design. The interior then closely, but not always perfectly, falls on that framework. My findings relate to the idea behind the exterior framework, over and onto which the 7/11 interior framework almost flawlessly fits*. ...We can already derive some information from it. The architect has worked not with inches but with meters and has conceived it from the outside inwards. No precisely defined spatial requirement or, possibly, the given length of a piece of furniture predominates, but the layout of the house itself. It therefore forms the architect's first design step. The points relevant to the structure lie at the four corners of the building. The dimensions of the internal space, on the other hand, are obtained only through structural components, namely the requisite wall thickness. The internal space is consequently a secondary design product which is already subject to structural constraints. If we follow the simple and proven principle, the whole-number values can also be set out as grids. Whole-number planning is evident in a great many Egyptian structures (e.g. in the Oracle Temple in Siwa). However, 100% correspondence is not always evident. You can and should read the rest. The point is, you cannot get into Hemiunu's mind if you think in meters or inches. You gotta think in cubits. There is no plausible way around it. 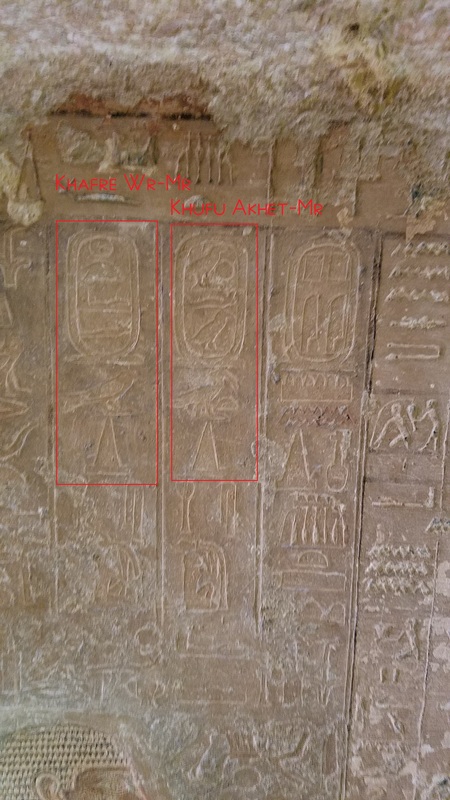 I merely use the term Khufu Akhet to make the point that G1 is not the Great Pyramid as is widely stated, at least not in the view of an Old Kingdom scribe and priest overseer buried right next to it. Idu is my witness. *The subterranean chamber's center, where the depression begins is just about 2+9 cubits south from the pyramid's central plane, but the horizontal segment of the passage to it is just over 8 cubits below ground. I think you can explain any deviations of the sub-structure lay-out from the above-ground grid: A grid really only makes sense if you're dealing with hewn blocks. Also, we cannot be sure that the below-ground features were made in the same era as the super-structure. Maybe the unfinished appearance was meant to be a decoy to mislead tomb robbers to look elsewhere and Khufu is actually buried somewhere there or this was a tomb carved for an early dynastic official later abandoned. In any case, I wouldn't make too much of any deviations from the 7/11 grid down there just like, as per Gantenbrink, some deviations above where the grid mostly does apply are actually to be expected. A grid is a guide not a guard. Edited 3 time(s). Last edit at 18-Mar-18 21:52 by Manu.